Most famous among the Greco-Roman deities associated with wine is Bacchus, also known as Dionysus, god of the grape harvest who is credited with teaching man the art of winemaking. 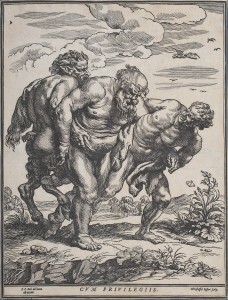 His retinue typically includes maenads or bacchantes (drunken, dancing women of dubious virtue), and satyrs. 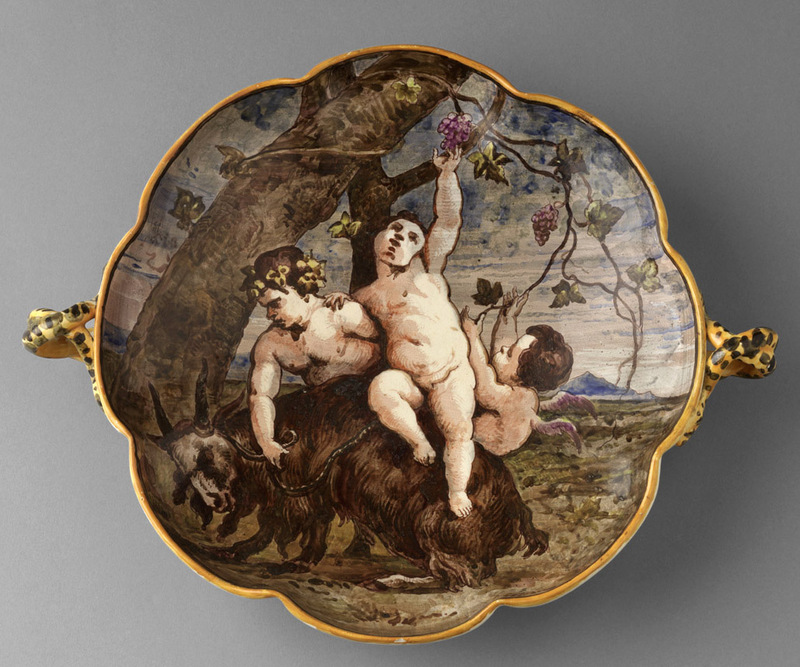 Bacchus is often shown as a handsome young man wreathed in grapevines or as a small child—presumably inspired by popular Greek myths in which the infant (disguised as a goat) is nursed and tutored by Atlas’s seven daughters, the Pleiades. 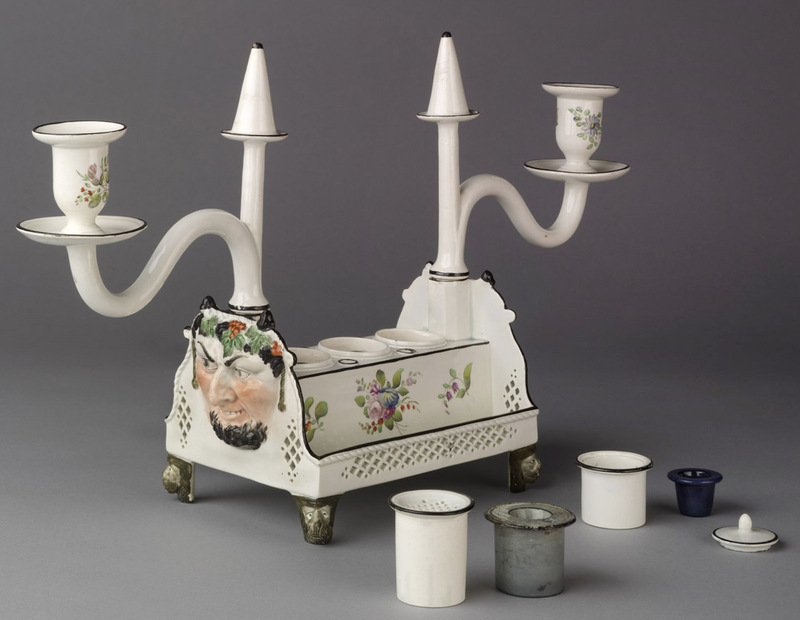 Throughout history, these and other deities have been portrayed in nearly all materials as three-dimensional sculptures, relief ornament, and painted or printed designs. They have also featured largely in literature and music. 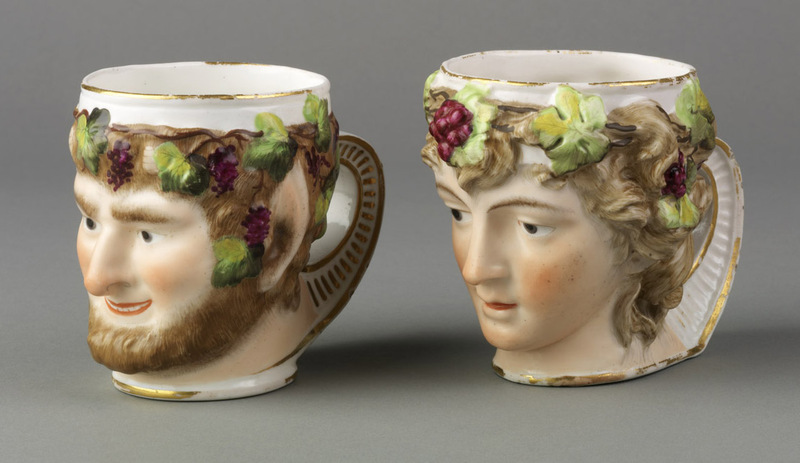 Unlike more complex, multi-faceted gods, classical wine-related deities more typically are associated with excess, whether in love or drink. 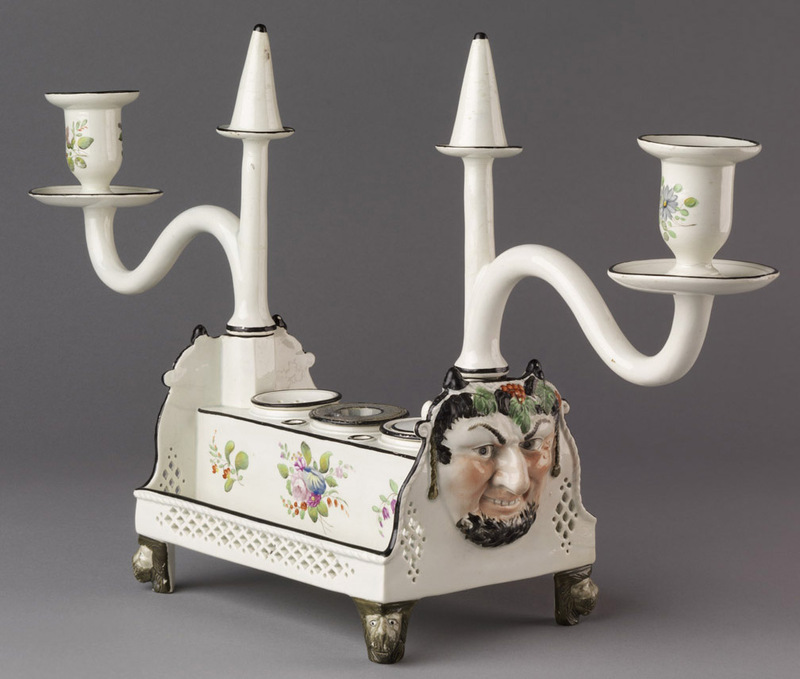 From the 1600s through 1800s, educated members of society would have been familiar with the subtleties of such meanings as would those who learned of the classical gods through popular story telling. 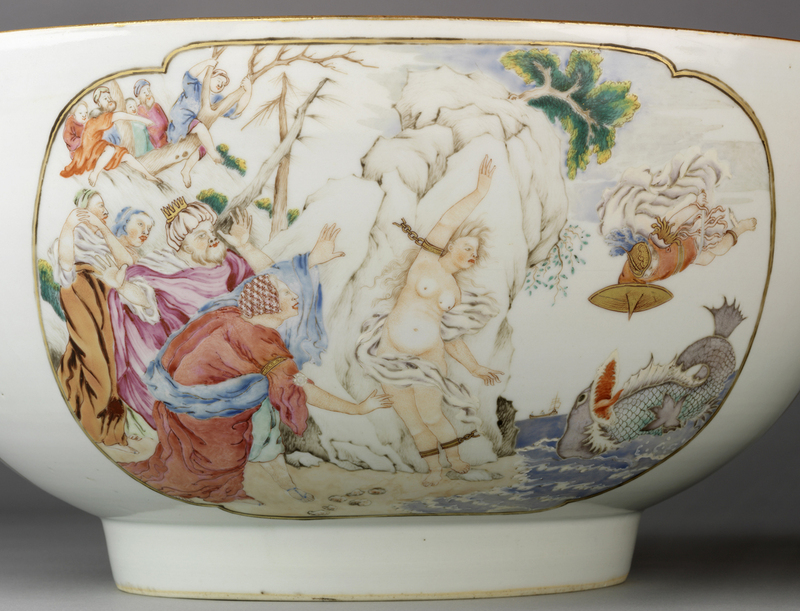 This punch bowl features mythological scenes based on Pieter Stevens van Gunst’s engravings for a 1732 edition of Ovid’s Metamorphoses. On the interior, the Triumph of Bacchus portrays a procession with the god in a carriage surrounded by dancers and drunken satyrs. On the exterior, the Fall of Phaeton shows Zeus disguised as a scorpion striking Phaeton from the chariot of the sun. In a second scene, Perseus rescues Andromeda from a sea monster; in the third, Pluto carries Persephone off in a chariot. 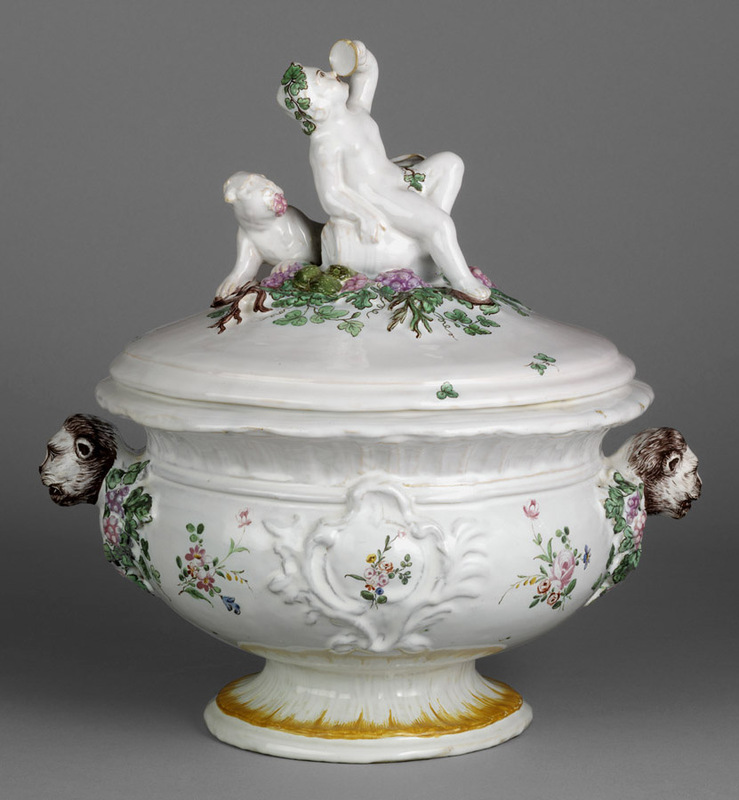 A nearly identical bowl has an early history of ownership in South Carolina. 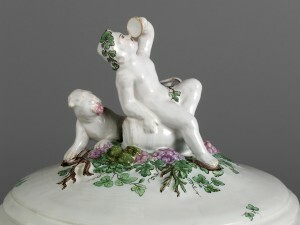 Goats are associated with the Infant Bacchus as well as fertility and are often included in scenes portraying the child-god. 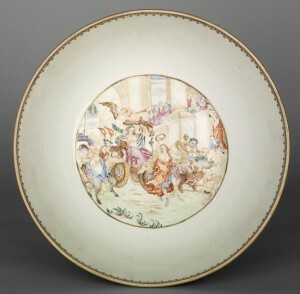 The Dihl porcelain group may have been made in competition with the Sèvres factory’s “Surtout de Bacchus” a set of figures intended as ornaments on elegant dinner tables. 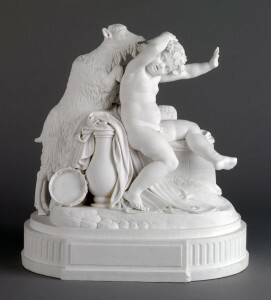 This pitcher’s goat and boys perhaps imitate figures in the Bacchanalian Triumph by Claude Michel Clodion, a relief version of which was made in Wedgwood’s terracotta stoneware around 1772. 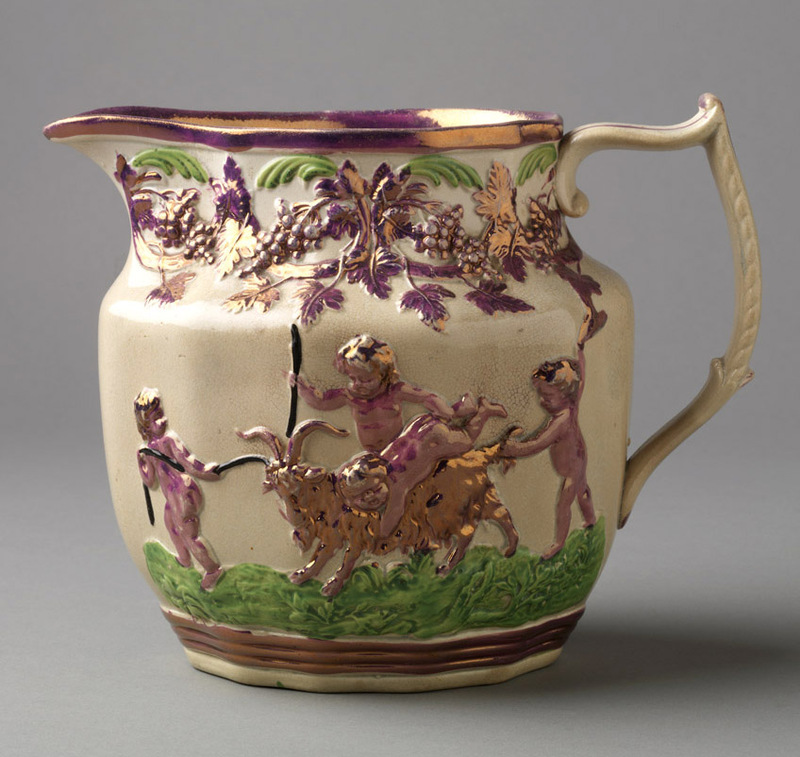 Side two of this pitcher incongruously portrays three 19th-century sailing ships. 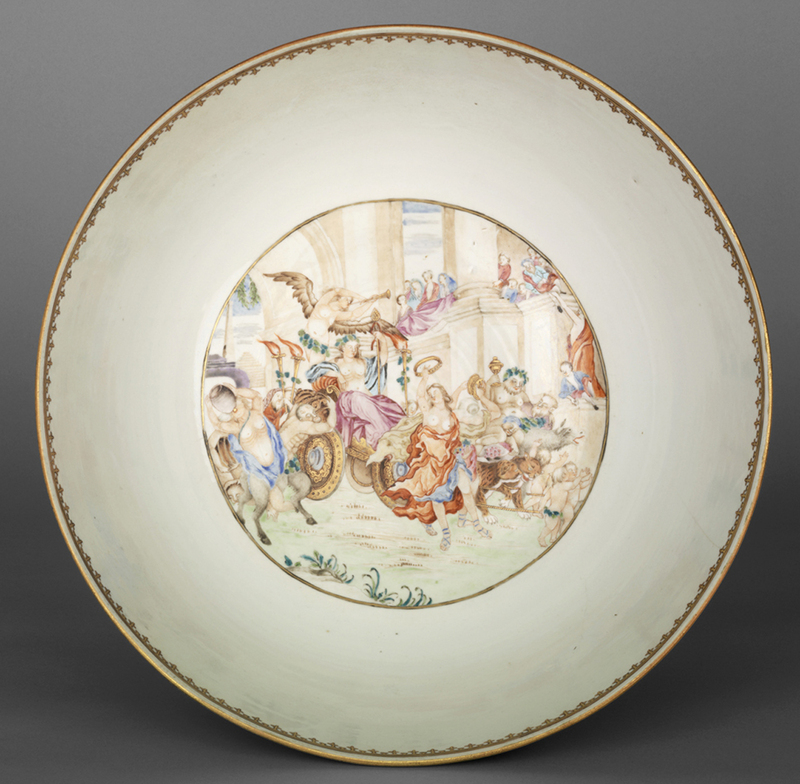 This low, two-handle Wedgwood dish painted by Emile Lessore is in the form of an ancient drinking cup. Similar-shaped dishes also were produced in other ceramic typesand in 19th-century metalwork. Hartford restaurateur and collector A. E. Brooks included images of local Bacchus carvings on an invitation to view his collection of firearms and war relics. The “Windham Bacchus” (left) is said to have been carved by captured British navy men in 1776 for Mercy Lathrop Fitch Carey, a Windham, Connecticut, tavern landlady who supplied the prisoners with food. The carving functioned as a tavern sign until it was given to the Windham Free Library in 1905. The black “Norwich Bacchus. 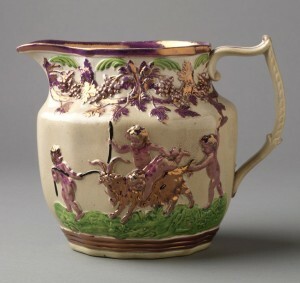 1778” (right) may refer to the tavern sign carved for the Backus Hotel in Norwich. 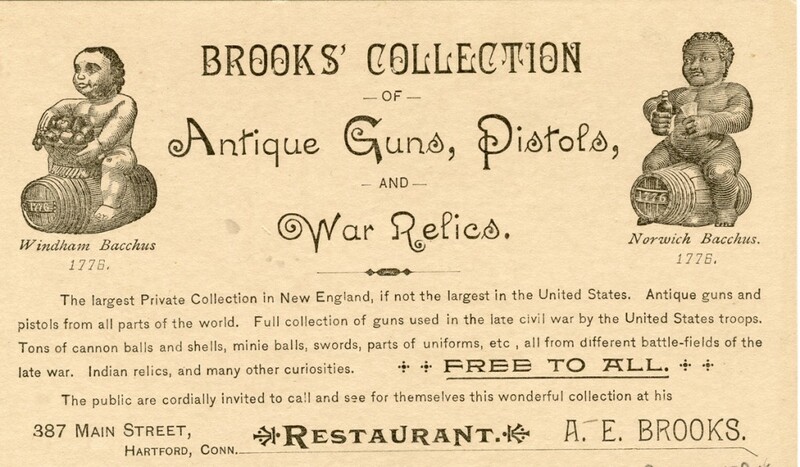 That sign is now at the Connecticut Historical Society. Infant Bacchus figures are commonly portrayed with grapevines and stemmed glassware, as references to wine and drunkenness. This unusual tureen also features a panther with a mouth full of grapes. The large (30 inches tall) figure group, made from lead, was acquired by Henry Francis du Pont for the Winterthur garden. 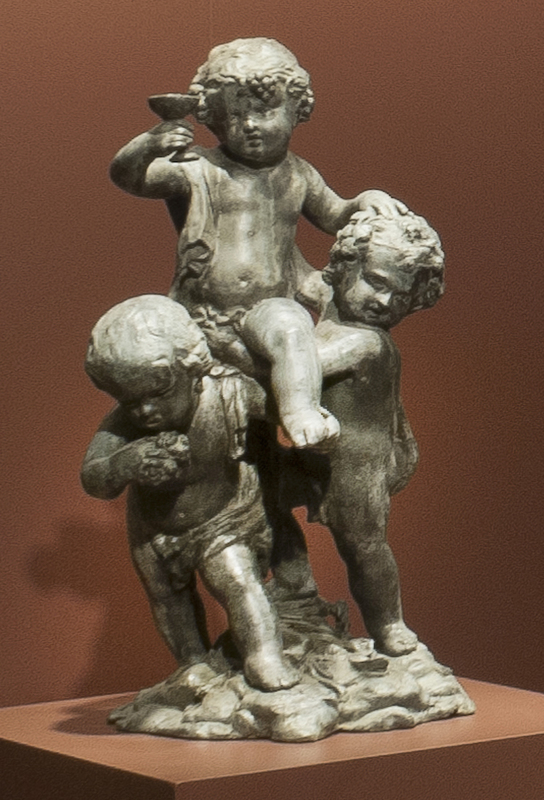 It and its mate were part of the ornamental display around the Winterthur swimming pool (now the Reflecting Pool) that included nearly two dozen Infant Bacchus and putti figures. 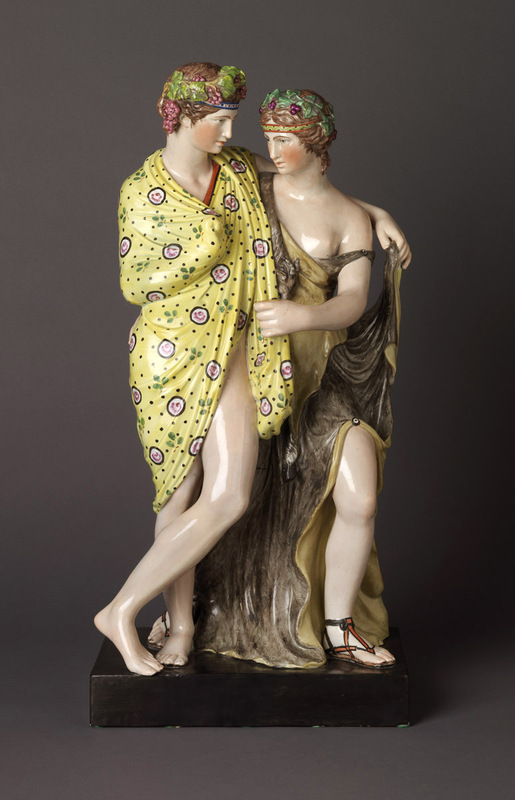 Better known as Bacchus and Ariadne, these figures resemble a Roman marble identified as Priapus and a Maenad. Priapus was the son of Bacchus. 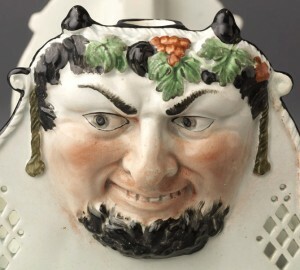 Typically shown as ugly and with “aggressively male” attributes, he was worshipped as a fertility god. Late 18th-century versions of the figure group survive in marble, bronze, ceramics, and prints. 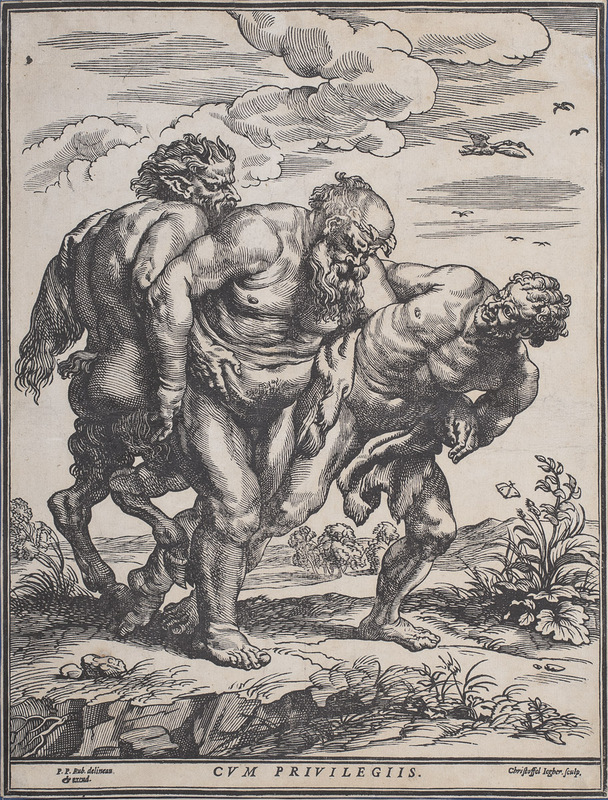 Silenus—elderly, wise, prophetic, and eternally drunk—has been portrayed as the tutor or a follower of Bacchus. He sometimes appears with the ears, legs, and tail of a horse. 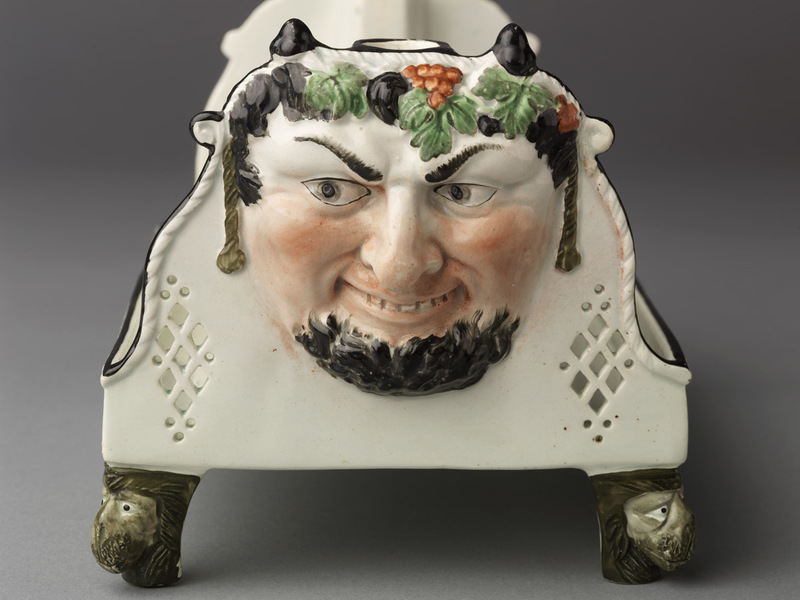 Grapevine-wreathed satyrs’ masks are among the most common design elements found on decorative artwork of the late 1700s and early 1800s. Relief versions ofsuch masks often ornament the pouring lips of neoclassical jugs intended for serving alcoholic beverages. On this rare inkwell, masks ornament the ends of the stand. The lion-mask feet also are references to classical designs.